﻿​﻿It is late evening in the Mid Western region of Japan, men walk through the dense forest causing the sound of rustling trees and leaves. They try to move with stealth and caution as they carry their crossbows and arrows laced with a special posion used to kill demons. The head hunter quietly instructs his men, "This is heavy demon territory, be on the look out and stay alert." As they continue their hunt, a large lizard demon that was lurking in the trees slithers down with extreme speed. It has a blue/green skin color and is scaly with bulging eyes as it opens it's mouth wide allowing a blue demonic acidic fluid to fly out that hits one of the men in the face causing him instant pain and blindness. The demon hunters begin shooting their crossbows at the lizard but it is very strong as it grabs and breaks the arrows or knocks them out of the way when they fly in his direction. A hunter yells out, "Keep on him men, don't let the demon live !!" Finally one of the arrows hits the demon straight through the chest area causing the demon to become violently angry as he pulls the arrow out and snaps it. The lizard, intent on killing the demon hunters charges at them and begins attacking the men one at a time as he picks one man up and throws him into a tree. The lizard then swipes his mighty claws at another man causing bloody slashes on his cheeks. The leader of the demon hunters shouts out to his men, "Retreat men, Retreat!!" The men all begin to scatter and run away in different directions leaving the lizard demon to deal with his wounded chest. The demon does not feel pain from the wound but touches the damaged area as it slithers off again to get some rest to help him heal faster. Heroshya lives with his mother in the Mid Western region not far from his father's empire. It is a lovely morning when Heroshya informs his mother that he plans to go spar with a demon companion of his. Heroshya gives his mother a kiss on the cheek as he tells her, "You look absolutely radiant today mother." She knows her son well as she replies, "Such flattery so early in the day? What news do you have for me?" Heroshya informs her, "I wish to go away to the Northern lands to train with my sword. If I am to go, I will train for many weeks." She closes her eyes as she ponders, "Have you spoken with your father regarding this?" He explains, "Father is the one who suggested that I master the new sword by training in the North however we both knew that you would not be happy with the idea." His mother replies, "I am your mother, Of course I fear your demise. I am quite aware that this training will consist of your fighting with huge, fearsome demons. I suppose I don't have much of a say. After all, you are full grown now and if your father suggested it, then I shall give you my blessing." Heroshya responds, "Thank you mother." He begins to walk away but she does not want him to leave as she plays on his heart strings a bit, "I will just remain in our lonely hut awaiting your return." Heroshya stops walking and turns to face her, "Mother, what are you saying? You will not be lonely you have many demon friends and what hut do you speak of ? We have the biggest HOUSE in the Mid West. Father had this extravagant home built especifically for our comfort and enjoyment. " She responds, "I am of pure dog demon breed and mother of his first born child, yet he marries a pathetic human woman and makes her queen of his empire. Do not talk to me about your father's so called good deeds." Heroshya tells her, "Mother don't go upsetting yourself. I must go but I will bring you back a bunch of red berries, how would you like that?" She responds, "Don't be silly, You know I dispise human food. Just because you have allowed your father's human family to get you accustomed to eating such things doesn't mean I will do the same." Heroshya smiles and says, "Mother, we both know you like red berries. When ever Nephra gives me a basket of them I always catch you sneaking a few." She turns her head, "Hmf!" He continues to leave, "I won't be gone too long mother." Once he leaves she decides she would like some fresh air and takes flight through the Western skies. While high in the air she can see Sesshomaru's large castle causing her to think about how things did not turn out the way she thought they would when she was asked to provide him with a child. She has a flashback of the day Sesshomaru's mother came to her, "Nanala, I have come to you regarding my son, Sesshomaru." They begin to walk as she continues, "The time has come for him to have a child. My son is soon to have a very stealthy empire, even now they begin work on the castle in the Western lands he will rule over. He will need to pass his power and position on to an heir." Nanala asks, "Why do you ask me? How do we know he will want me to bear his child?" She replies, "I believe you are the best choice, you are extremely beautiful, you have no other children and you are a pure dog demon of our clan. Whom else could replace you? If you do this, your child will be royalty and heir to the throne of a very large and powerful empire." Nanala is curious, "Will Sesshomaru wed me once this arrangement becomes official?" The queen mother sighs as she explains,"Sadly my dear, I can not say. His behavior has been most odd lately, spending his days in the company of human children. He has been visiting a little human girl, providing her with gifts. I am not sure what to make of it. Perhaps you are exactly what is needed to help him gain his senses back. It is unlikely that he would lay eyes on a raving beauty such as yourself and continue to carry on the way he is?" Nanala's flashback ends as she remembers agreeing to the courtship with Sesshomaru. She thinks to herself: That should have been my son and I residing in the huge castle filled with demon servants, curse that human wench and Sesshomaru for choosing her over me. ​After taking a lengthy trip around the Western lands she decides to head back to her home. As she lands, she can hear footsteps near by and she can smell human men. She wonders why there are humans in demon territory as she uses demonic lasers from her eyes, the red hot beams shoot out so fast and poweful that it creates a path with smoking, broken tree branches and disturbed ground. Nanala shouts, "Who is there? Show yourself !" At that moment, several human demon hunters come out from hiding behind the trees. Nanala finds herself surrounded by them as they begin to shoot off arrows at her. She is not worried about the arrows as she feels they are silly, useless weapons that cannot harm her. She feels that it is a waste of her time to bother fighting these weak humans but she uses her demonic blast as a shield causing the arrows to drop before reaching her, when she sees her chance she attacks a couple of the men by disappearing and then reappearing behind them. She never lays a hand on the men but instead she raises her hands and her demonic power causes the two human men to rise from the ground, she pushes her hands outward and they go flying. One is slamed into a tree while the other hits the ground hard. The other men realize that this demon is vicious and aim to bring her down quickly but as they attempt to run towards her she is always too swift and aware of their movements. They are having much trouble when one of the men that is lying on the ground from her attack is awake but pretends to be dead. Nanala indeed thinks he is seriously harmed or dead so she pays him no attention as she continues to take on the other humans. Suddenly she senses someone behind her but before she can turn around the demon hunter that was pretending to be dead gets up and grabs one of the nearby arrows, he quickly tries to plunge it into her body but she is only scraped in the back with the arrow because she turned around in time and slashed at the human with her claws. The scrape with the arrow was not very painful but it causes her to become very angry and she turns into her dog form and begins attacking with a vengance causing the men to retreat and run off. She turns back into her humaniod form as she wonders about the wound on her back she tries to look in a mirror to see how bad it is but she has a difficult time seeing. She attempts to use demonic power to heal it but to her surprise it does not heal but she dismisses it and tells herself it is a small, unimportant wound caused by a silly human. -------------------------------------------------------------------------Heroshya spars with his male demon friend all of the morning and part of the afternoon. Afterwards they go walking in the woods as Heroshya goes to pick the red berries for his mother as promised. During their walk they come across a lizard demon dead under a tree, Heroshya says, "What in the world? What could have possibly caused the death of a strong demon like this?" Heroshya's friend informs, "Haven't you heard? There have been demon hunters around the Midwestern area. I've heard that they create a poison by soaking lots of those carnivorous moon plants, humans are immune to its deadly flesh eating poison that kills demons. The demon hunters submerge their arrows in the poison fluid and attack demons with it. The venom is so deadly it causes a powerful demon's death within 2 days. Heroshya begins to gather some red berries as he responds, "I will need to warn my mother of this once I return home." His friend informs, "Yes, you should. These demon hunters are attacking more frequently than before; many demons have been killed by these horrible poison arrows. Heroshya returns to his home right after the sunsets, he walks in and yells out, "Mother! I know I'm late but I brought the berries as I said I would." Heroshya wonders where she is he looks over to where her bedroom is and the door is slightly ajar, he slowly opens it as he again calls out to her softly, "Mother." She responds, "I am here son." She sits up on her bed holding her clothing against her bare chest as her back is bare and revealed. Heroshya can see the bloody scrape on her back, he quickly gets water and cloths. He begins to clean and bandage her wound as he asks her, "Please mother, tell me what happened." She tells him the whole story and when Heroshya hears about the arrows he remembers his friend telling him about the human demon hunters and the demon poison upon the arrows. He is instantly worried but does not want to tell his mother about what he knows as he ponders on what to do, he asks his mother, "Are you feeling weaker mother?" She says, "No, Only a bit dazed." Herohsya hopes he has time to get the poison out of her system as he tells her, "Mother, just rest easy. There is something I must see to." Heroshya immediately goes to his friend that told him about the demon hunters and the poison arrows. He explains that his mother is now in danger. His friend informs, "You'll have to move quickly, there is a demon who may be able to cure her. His powers are purely made up of various types of toxins and he knows about every type of poison imaginable. He has the ability to strike his enemies with venom however, he can also steal or pull venom from his enemies and add to his powerful collection. Hurry, fortuneatly he will be easy to locate, you will find him deep in the Western woods outside the boundries your father's empire." Heroshya wastes no time in going to the Western area seeking the demon that lives outside the boundries of his father's empire. He knows the demon should not be too difficult to find because most of the demons living in the West are residing in the demon village around his father's castle. Heroshya does come across a demon but he is not sure if this is the one he needs to speak with regarding a cure for his mother being poisoned so he asks him "Are you a demon poison master?" the demon responds to him, "Who is asking, Who dares to come to these woods?" Heroshya ignores his question getting right to the subject, " I need information about the poison that kills demons." The demon replies irritated, "Who are you that I should provide you with this knowledge? Instead you will die for your intrusion!!" The demon attacks immediately, he is full of many different powerful venoms as he opens his mouth and allows a strong green mist to be released. Herohsya coughs roughly as he covers his nose and mouth to avoid the mist. He did not realize how strong this demon's venoms would actually be, the smell of the toxic fumes is making him sick so as the demon's mouth is open Heroshya uses his finger whip, wrapping it around the demons throat and pulling hard, causing him to choke and to close it's mouth. He grabs onto the whips trying to release it's grip on his throat, as he uses another toxic posion that burns through the whips allowing the demon to breathe once again. The demon is now really angry as it viciously charges at Heroshya with a weapon that looks like an axe on a long stick. He weilds it wildly as Herohsya blocks all of his attempts to strike him. Worried for his mother and knowing that she does not have much time before the deadly poison in her body takes affect, Heroshya uses his best swordsmanship on the demon wounding him badly. The demon has one last trick as he emits funnels of strong poison. Heroshya is growing angry at this demon as he says, "I don't have time for your pathetic attacks!" at the same time he draws his sword allowing the wind element of it to blow away the funnels of poison with ease. The demon is stunned to see that nothing he seems to do is affecting his enemy. Heroshya walks up to the demon swiftly with sword in hand and places the point of the sword under the demons chin,lifting his head with it forcefully. The demon yells out, "AAAhh...Please do not kill me." Heroshya asks him, "Will you tell me what I need to know?" The demon replies, "Yes, Yes, anything!!" Heroshya gives his request again, "I want to know everything about the poison that kills demons within 2 days. The poison that the demon hunters are using on their arrows." The demon tells all, "That poison sounds like the moon plant, it is extremely deadly to demons. Any demon that comes in contact with that venom will have horrible head and stomach pain, they will become weaker in demon power and physical strength until they eventually succumb to all these side affects and die upon lying down to rest. No demon has ever lived more than 2 days once the moon plant has entered their system. " Heroshya feels a stream of sorrow rush though his body as he thinks of his mother going through such pain before dying. He can barely speak, his voice is a bit shakey while holding back his painful emotion he asks the demon, "Do you know how to cure it? Can you pull the venom from a demon's body?" The demon replies, "I can only pull venom that I can use as a defense against my enemies, because it is deadly to all demons...that poison would kill me also if I were to come in contact with it, therefore my powers will not allow me to pull it from another." Heroshya is so angry and distraught he tells the demon, "You are useless, No longer needed!" He raises his sword intent on killing the demon violently due to his sadness, sorrow and disappointment, the demon yells out, "But I do know how to cure it!!" A ray of hope comes back to Heroshya as he holds back on killing the demon and listens to what he has to say, the demon explains, " There is a simple elixur that can cure it instantly upon drinking it, no matter how far along the poison is in the system. I know where a fountain of this elixur flows and all that is needed is a small drink from it. There is only one problem. This fountain of elixur not only cures demons of this poision, it performs many miracles for humans as well so it's constantly gaurded by two strange soul spirits that are not of this world but of the Underworld. You see the fountain has powers from the Netherworld, It was given long ago to provide the gifts of life, wisdom and beauty. Humans were greedy and fought over this fountain, they waged wars over it and many were killed causing this gift of the Netherworld to become tainted with evil, this summoned the souls from the Underworld to come and gaurd it allowing no one, humans nor demons to use the fountain. You will have to kill these souls if you want to use the fountain but how can you kill something that is already dead? I can not tell you but a warrior as skilled in fighting as you I'm sure can figure something out." Heroshya rushes off leaving the evil poison demon behind as he thinks, "Souls from the Underworld, Father will surely be able to defeat them with the Tensaiga. I will go to the castle to get his assistance and we can have the elixur to mother before morning." Heroshya has been all night seeking answers and trying to get help for his mother, by the time he reaches his father's castle, it is nearing sun rise but he requests to speak with him at once. Sesshomaru leaves his resting quarters to speak with his son, Rin is worried about Heroshya's presence at such an odd time of night that she follows her husband. When she sees Heroshya she asks him, "Heroshya, Is anything wrong? Are you okay?" He responds, "It's my mother lady Rin, she has fallen very ill." Rin responds, "I'm so sorry, This is awful...What can we do to help?" Heroshya looks at his father, "I must ask your assistance, mother will need to drink from an elixur that is gaurded by two souls from the underworld, the Tensaiga will be needed to send them back giving me access to the fountain." Sesshomaru responds, "So, you have sought information about an elixur that you believe will save your mother. Have you forgotten she is a powerful demon? What illness could possibly cause her demise?" Heroshya responds, "She has been poisoned by human demon hunters." Sesshomaru is not convinced that there is any real threat to her life as he says, "Hmf, ...Nanala could never be killed at the hands of humans, we both know that Heroshya." Heroshya pleads, "Father please, precious time is being wasted as we discuss this, even now she is becoming weaker!" Rin listens on as she feels sorrow for Heroshya and his mother, Sesshomaru again explains, " I'm sure you are overreacting to this. Go back to her and I shall travel to the Midwest tomorrow to assess the situation myself." Heroshya argues with his father , "No, I won't rest until I get her this elixur. If you will not help me then I beg you to lend me the Tensaiga's power and I shall get rid of the Underworld apparitions myself." Sesshomaru explains, "Son, I would, however...You will not be able to weild the Tensaiga, just as no other demon is able to control your sword's powers. Gifts that are handed down can only be used by the intended master." Heroshya begins to walk off as he says, "I will save her myself, I won't let her die." As he is walking to leave he suddenly stops and turns back to his father, "You know, I don't understand you. If it were Rin who fell ill you would be at her side with lightning speed ready to risk life and limb, but for my mother....you do absolutely nothing!" Rin's eyes raise a bit as she is shocked at Heroshya's words however she is empathetic at how angry he is. He turns to continue walking as Sesshomaru calls out to his son "Heroshya!!" Heroshya does not turn around or stop walking as he shouts angrily, "Nevermind!!" Sesshomaru and Rin watch as Heroshya storms out of the castle. They say nothing to each other but they both have thoughts on the issue, Sesshomaru thinks: Could Nanala's life be in serious danger? Perhaps the situation is dire and I am taking it too lightly. He does not speak on the issue with Rin but instead turns and heads up to his resting quarter. Rin remains where she is as she also thinks to herself: I've never seen Heroshya so upset, I believe his mother may die if Lord Sesshomaru does not save her. I suspect he does not want me to know that he is running off to the aid of another woman but I know my dear husband all too well, He will not stand by and do nothing, He will not allow her to die. Heroshya heads back home to his mother, as he is quickly flying back he thinks to himself: Please do not let it be too late, I have already used up most of the first day trying to gather information and get help. Heroshya makes it home and the sun is slowly rising, it took him all night and the early hours to accomplish what he has. When he sees his mother again she is still resting on her bed as Heroshya goes to her and holds her hand asking, "Mother, how are you feeling? Are you any better at all?" She responds, "I fear I am getting weaker. I don't feel like myself." Heroshya explains, "Father says he will come here to check on your condition but he would not come with me to find a cure." She closes her eyes and says, "I am not surprised, your father has never cared of my well being. His only concern is for that useless human of his." Heroshya tells her his plan, "It doesn't matter anymore mother, we don't need him. listen I know of an elixir you need to regain your strength but you will have to come with me for time sake. I fear that if I travel to get the elixir for you and try to return it here...it will then be too late." Nanala is curious as she asks, "What do you mean too late?" Heroshya does not want to tell his mother that she will die and he lies, "I just mean your powers may be completely drained, that's all. Now come on mother, we must hurry." She tells him, "I am unable to transform into my dog form," He asks her, "Can you fly in human disguise." She says she is able to as they both fly off to the place where the elixir is known to be guarded. When they land in the place, Nanala is a bit wobbly and tired as she replies, "The trip was longer than I had expected." Heroshya responds, "I know mother but you had to come with me. You should be able to rest while I get the elixir." Heroshya has no idea how he is going to send those two souls back to the Underworld, he cannot kill them because they are already dead. As they walk thru this long path they are suddenly ambushed by groups of flying vulture demons, as they swoop down Heroshya and Nanala must immediately begin fighting them off. . The vulture demons swipe their long talons and snap at the both of them, Heroshya uses his sword killing most of them with one mighty swing as Nanala uses her demon powers to strike at them also killing the vultures in her path. Once all of the vultures are eliminated, Nanala falls softly to her knees and her breathing still heavy. Heroshya swiftly goes to her and kneels down in front of her as he asks, "Mother, What's happening?" She replies, "I have used all the energy I had left on those vultures. I feel completely drained of power." She attempts to use her demon lasers and they come out extremely slow and the dark red color that her laser beams usually are, is now a light pink color that indicates the lasers are weakening. She attempts to use another power and nothing happens. She continues telling Heroshya, "We didn't make it in time, I'm completely void of my demonic powers." She looks at the palms of her hands as she asks, "What did those humans do to me??" Heroshya responds, "Mother, Do not worry about your demon powers right now. They will come back once you are cured. For now, I will protect you from any other demons that are guarding the elixir but we've got to get to that fountain." He wraps his arm around his mother's waist attempting to assist her to her feet, as she places her arm around his neck. They lift up and begin to walk but her legs are very shaky as she continues to keep her arm wrapped around her son's neck and he her waist for support. Nanala walks as best she can but the more they walk the more wobbly her movements are becoming, causing Heroshya to decide to lift his mother and carry her the rest of the way. With both her arms now wrapped around his neck, she lies her weary head on his shoulder as he continues on carrying her, she says, "If I do not make it through this, I will be happy just spending my last moments with my only son." Heroshya calmly replies, "Do not speak like that mother. We will get the cure, We're very close now...I can smell and hear the fountain." Meanwhile, Sesshomaru is back at the castle and is preparing to go to the Midwest to see about Nanala's condition. As he sheaths both his Buksaiga and his Tensaiga, Rin comes down the long stair to the throne area where her husband is and she also has on her battle gear and a couple of weapons. Sesshomaru asks her, "Rin, what is this?" She replies, "Milord please let me come with you, I want to help." Sesshomaru responds, "No Rin, you are to remain here." Rin replies, "Nanala may need my help, If she was poisoned by humans then I can go to the human village and find a cure. The villagers still fear demons, they may not give you the information you'll need." 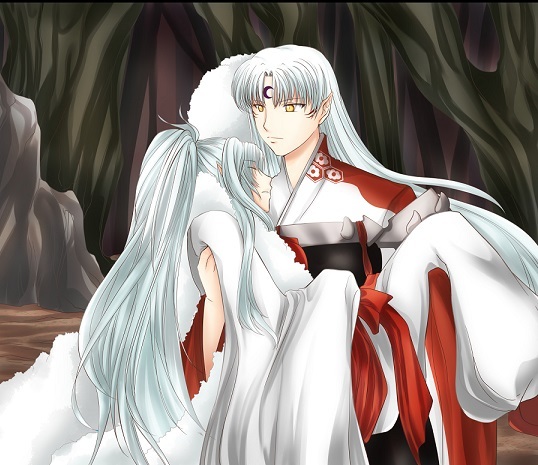 Sesshomaru agrees to bring Rin along as he sees no reason that she would be in danger. When they reach the Midwestern area they go to the home that he had created for Heroshya and Nanala but they are no where to be found. Sesshomaru and Rin look around the place is abandoned causing him to wonder where they could be. Rin gives a solution, "Well, let's not waste time. I say we go to the nearest human village to get information as I stated before. If we can find out what poison these demon hunters used we can find a cure and then find Nanala and Heroshya." Sesshomaru agrees as they fly at top speed to the nearest human village. Rin suggests that Sesshomaru stay out of sight while she goes to question the villagers about these demon hunters. When she returns she has much information as she relays it, "My Lord, we have to find Nanala, the situation is serious. She has been poisoned with the moon plant, I was told that she will die two days after being exposed to it." Sesshomaru replies, "If Heroshya informed us of her condition last night that would mean this day is her last." Sesshomaru thinks to himself: I should have taken action when Heroshya requested my help, now she can not be saved. As Heroshya walks and carries his mother along, he can see the fountain in the distance but before he can reach, creatures with long, sharp teeth begin to poke their heads out of holes in the ground. Heroshya thinks to himself: another form of protecting the fountain, I wonder how many obstacles there will be until I reach the Underworld guards. These traps were set up to ward off humans, I should get to the fountain easily. He simply flies over avoiding the snapping ground creatures and he is even closer to the fountain now. It is a beautiful fountain with a purple glow, it looks as if it has powers beyond this world. He can also see the souls, that hoover in the sky over the fountain. The souls faces can not be seen, hidden by a long white hooded cloak as they hoover in a standing position over either side of the fountain. Heroshya thinks he will speak with them, explain his situation but before he can....very dark evil looking Underworld souls, with black wings and horns begin attacking. Heroshya places his mother down on the ground and says, "Don't worry, I will fight them off and get that elixir." Heroshya unsheathes his sword attempting to fight the souls from the Underworld off but they do not seem to be even affected by his sword strikes or demonic powers as he thinks: They arehg already dead, no power or sword from this world will affect them. What am I to do? I cannot waste anymore time! The sun is already beginning to set, my mother only has mere moments! ​The dark underworld demons do not carry swords as they are only striking Heroshya with dark bluish balls of powerful force that he is able to avoid with his sword and demonic shield. One of the evil underworld demons strikes at Nanala seeing her weak condition, The strike barely misses her as Heroshya instantly runs to her and joins her on the ground, "Mother, are you okay?" she replies, "Yes I'm okay." Heroshya feels he has a serious problem because he now knows that if he leaves his mother's side,the Underworld souls will attack her but if he stays by her side he will not be able to fight them or their attacks on him effectively. He holds his mother close and attempts to shield off the blows of force coming from the Underworld souls by using his demonic blast shield but the attacks come from all over due to the many dark souls that are protecting the fountain and at times he is not fast enough to avoid them. He is hit with one of the balls of force, though it does not kill him the pain is unbearable when it strikes him causing him to yell out but this makes him hold his mother even tighter, protecting her knowing that if she is hit with one of these it will surely kill her. Nanala can no longer stand to see her son suffer as they hold each other she says, " Leave this place. You've done all you can." Heroshya continually tries to sheild off the blows as he yells at her, "Mother, what are you saying!!" she replies, "Son, I'm dying. I haven't even the strength to hold my own head up any longer. I cannot bear to see you die also. Leave this place and live on, I have had a long fulfilling life." Heroshya is not fast enough sheilding himself and is hit again with a force as he yells from the pain once again. He is starting to succumb to the pain as he replies to her in a weak shakey voice, "No, I cannot live without you Mother. My life would be filled with only saddness." The forces are steadily coming and Heroshya tries to ward them off but is weakening himself from the two blows of force that already hit him. Nanala responds again, "You have your father and sisters that need you in their lives son, Please do not let yourself die for me." Heroshya responds coldly, "I have no father any more, He is dead to me. If I can not save you, we will die here together mother." Heroshya decides to no longer shield off the blows. He is holding his mother in his arms and closes his eyes, she lets her head rest on his shoulders as they both prepare to die but after several moments, he notices the blows are not hitting him any longer. He opens his eyes and sees they are being blocked off by Sesshomaru and Rin. Rin using her Najinta blade and a sheild to ward off the blows coming at Heroshya and his mother while Sesshomaru is cutting down Underworld souls with ease causing their bodies to burst as they are cut down with the Tensaiga. Heroshya can hardly believe what he is seeing and he thinks: When did they get here? If my father and Rin had come only moments later, my mother and I would be dead. Hope comes back to Heroshya as he lies his mother down flat on the ground and holds her hand begging her, "Mother, please hang on. Don't give in to dying, we still have a chance to get the elixir for you." He can see the weakness in her eyes as she caresses his face thinking this may be the last time she lays eyes on her son." It takes mere seconds for Sesshomaru to finish sending all the dark souls back to the underworld leaving only the souls in white hooded cloaks whom stood by watching everything. Rin goes to Heroshya and Nanala, she kneels down at Nanala's side and tells Heroshya, "I will protect her Heroshya, Hurry and get the elixir quickly." Heroshya leaves his mother in Rin's hands. Rin lifts Nanala's upper body and holds her as she says, "You're going to be okay, we will not let you die." Nanala in her weak state thinks to herself: Why is this human risking her safety for me? Why does she allow her husband to come to my rescue? Her heart must be immense and her compassion for others beyond that of any other living being. She tries to smile at Rin but her smile is slight due to her weak state, Rin smiles at her in return. Meanwhile the souls in white cloaks slowly glide down to speak with Sesshomaru and Heroshya as they say, "We mean you no harm, you have killed the Underworld souls and you may now take what you need from the fountain." Heroshya wastes no time as he gathers up the amount of elixir and runs it over to his mother. Rin helps Nanala to sit up, assisting her to drink the elixir as Nanala states, "I can feel my energy slowly returning." Sesshomaru lifts Nanala and carries her as he flies off toward the castle. Heroshya takes Rin on his back and they fly also follow along. Once back at the castle Rin and Sesshomaru have a room prepared for Nanala as the family all welcome her to stay with them until she recovers from this whole ordeal. Rin, Nephra and Zephra are all happy to see to her comfort, treating her like one of the family and helping her through the illness, slowly nursing her back to good health and strength. Rin talks to her, telling her stories of traveling with Lord Sesshomaru and Jaken, Nanala laughs at some of their silly antics as it makes her think: This woman is different than the average human. What power does she use that forces me to admire her? Meanwhile, Heroshya speaks with his father at the throne, feeling guilty he tells him, "When I thought mother would die, at that moment....I hated you for it." 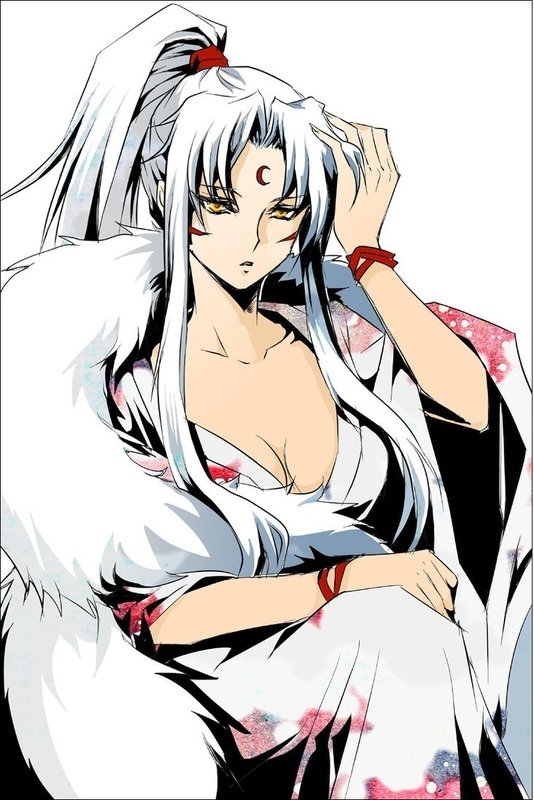 Sesshomaru replies, "Son, you believe that I do not care for your mother. You believe I would abandon her when she needs me, that is not true. You should know that I feared her death as well." Heroshya responds, "I know that now, I shouldn't have doubted you." He changes the subject, " Rin is amazing, risking her life and coming to the rescue of a woman she barely knows. I see why you love her so much." Sesshomaru responds, "Yes, Rin has the gift of warming even the coldest of hearts."